This New Year's Eve will be one that I will likely never forget. Not because of anything especially memorable, although I did make the best tasting slushies ever. It should never be forgotten because it was possibly the last time our entire family will ever spend this holiday all together, for a long time, and maybe even ever again. I love New Year's Eve. I usually get choked up and a pair of tears slide down my face at the height of the emotions. This year was very different. I didn't even notice/start counting the countdown until 3 seconds until midnight. I have always been very vocal from at least 20 seconds on. And no tears. I hugged and kissed each of my children and wished them Happy New Year. And it was over. Just. Like. That. I really am so excited for them all -- to grow into the people they are becoming. I will miss them terribly on New Year's in the coming years, but I can always recall the perfectly ordinary New Yxear's we shared tonight. 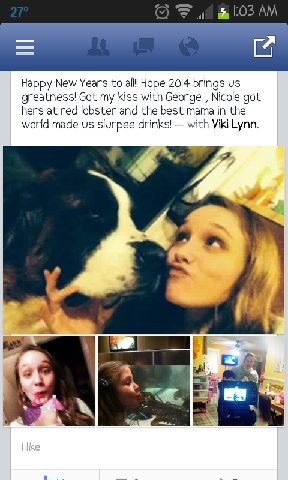 And a special thanks to my eldest for sharing a recap on her fb page. I shall save that for the scrapbook!